2x Control units - WITHOUT xenon burner - for "HID Xenon KIT retrofit kit"
LICHTEX AC In comparison to many cheap HIDs the control device pursues ALL xenon luminous means with change stream (AC-85V), thereby there do not flicker the distillers and reach 100 percent of his achievement. The increased light amount provides for an obviously better illumination of the roadway..
LICHTEX Ultimate CANBUS Controll unit - is currently one of the most advanced Ballast and is the best what we had tested until today. D2S D2R H1 H3 H4 H7 H8 H9 H10 H11 HB3 9005 HB4 9006 usw. 4000K 4150K 4300K 5000K 5500K 6000K 8000K 10000K 12000K 15000K usw. 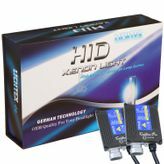 No rating for XENUS Truck 24V HID Xenon KIT retrofit kit- Ballast SET available.